Your vehicle’s factory carpets are very prone to stains, dirt, damage, and abuse from good or bad weather days. 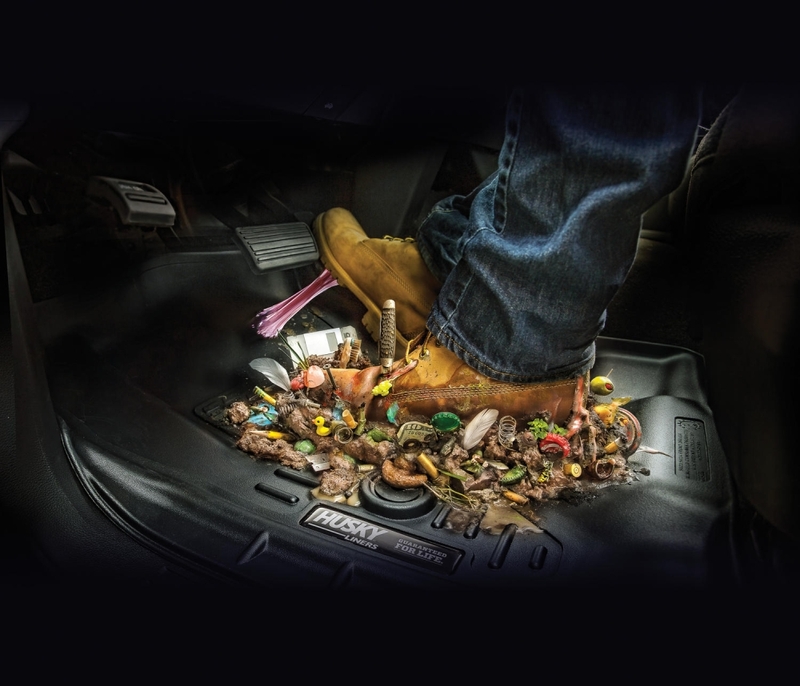 Engineers at Husky Liners designed the WeatherBeater Floor Liners to provide your pristine carpets with an armor-like protection for all seasons. Husky Liners WeatherBeater Floor Liners are crafted from super durable rubberized thermoplastic that will stand up against seasonal grimes like mud, water, snow, and also harsh chemicals like motor oil, gasoline, and battery acid. Its containment walls will trap all these filth from spoiling your carpets. They feature backing nibs that will securely keep your liners in place and stop them from sliding around. WeatherBeater Floor Liners will help you keep your interior’s factory freshness to keep each ride comfy and increase resale value. Get them in Black, Gray, or Tan colors to suit your personal taste and interior style. All Husky Liners WeatherBeater Floor Liners are backed by a lifetime warranty against breaking & cracking. Warranty: Limited LIFETIME warranty on all WEATHERBEATER SERIES products. For over 25 years, Husky Liners has dominated the segment of interior automotive protection. They pioneered the original custom fit cargo liner which made them one of most successful automotive accessories today. After the overnight success of their custom fit cargo liner, Husky Liners became the mat of choice by truck and SUV owners in the US and all over the world. The company has started to expand their product line and started to manufacture great selections of floor mats and floor liners for most cars, SUVs, and trucks. Husky Liners was founded in 1988 by Bob Tyler, a man that loves to hunt and fish but hates the dirt, snow, and grimes that his hobbies bring in to his SUV. After wanting to buy a washable cargo mat to protect his vehicle’s carpet and couldn’t find one, Bob decided he will make one. Today, over 100 employees share Bob’s passion for product innovation and love for vehicle protection. Husky Liners is now based in a 197,000 square foot manufacturing facility in Winfield, Kansas where all Husky Liners product innovations are researched, developed, tested, and enhanced. Today, Husky Liners offer a complete line of the finest automotive accessories that will protect and enhance your vehicle’s looks from the inside and out. With the company’s commitment to produce only the best quality interior and exterior products, the Husky Liners team work interdependently with each other starting from research up to quality control. Working closely together had let them identify and solve potential product issues before they even reach their customers. And the end result? 100% customer satisfaction guaranteed. Another aspect that Husky Liners pride itself is their unbeatable customer service. The members of their customer support team have an average of 12 years experience, so they can provide answers to almost all of the questions and issues raised by the customer. For further questions, customers are transferred to the engineers or other employees who designed the part or at least have been part of the team who developed the part. By combining great product quality and second-to-none customer service, Husky Liners is continuing to be at the forefront of vehicle protection and styling. 2007-2012 Dodge Caliber Husky Liners WeatherBeater Floor Liners, The Husky Liners WeatherBeater Floor Liners is designed specifically to fit your 2007-2012 Dodge Caliber without any modification to your beloved Dodge Caliber. Husky Liners WeatherBeater Floor Liners will also fit 2007-2017 Jeep Compass, 2007-2017 Jeep Patriot. If this Husky Liners WeatherBeater Floor Liners is not exactly what you are looking for to accessories your , please don't give up just yet. Our catalog has huge variety of parts and accessories for your .